We all see the adverts promoting 16Mbps or faster broadband services and each one contains a warning about line length affecting the speeds you may get. What is not always clear from the adverts is that the region you live in can also make a difference. The problem is not that ADSL is massively slower in areas like Northern Ireland and Wales, but that the broadband options offering speeds above 8Mbps are less likely to be available. The differences are illustrated if you look at the averages recorded across the 12 UK regions. The averages are based on over 138,000 speedtests from registered users of thinkbroadband.com and represent over 6,000 unique postcodes around the UK covering the period 1st January 2008 until 12th May 2008. The UK average download speed based on this data is 3,238Kbps. With postcode information it is also possible to break the results down into Counties and the larger cities. Only those areas with results from more than 40 unique postcodes have been listed. Only the thirty fastest counties are listed, the Highlands of Scotland down in 43rd place had an average of 2,177Kbps, the worst of those with over 40 unique postcodes. There were slower results but not enough samples at different locations to make it representative. Northern Ireland wins the crown of slowest UK region. 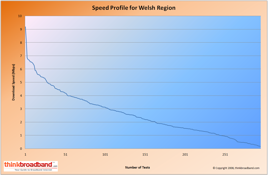 If one compares the speed profile from Wales with that of London, it is easy to see that differences in average speed are not just from a handful of people with 20Mbps connections but reflect the much wider availability of high speed options. Almost all telephone exchanges in areas like London have a wide variety of LLU operators compared to just under 25% of the exchanges in Wales. 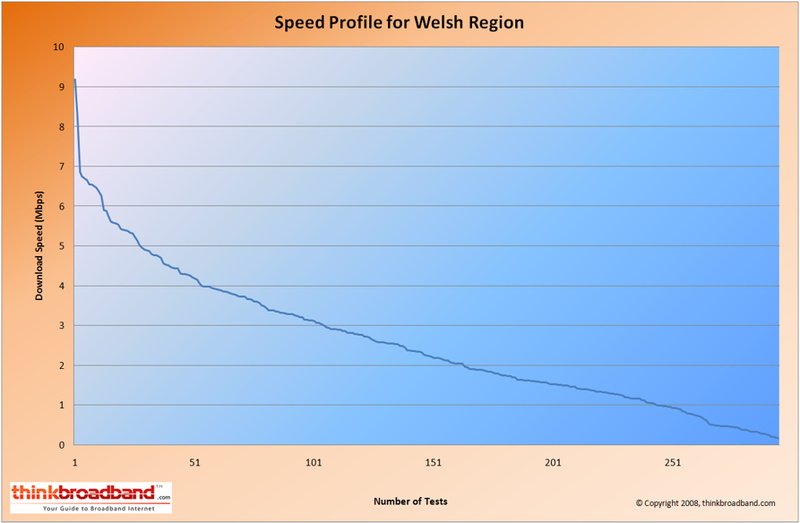 In Wales there were a mere handful of results at 7Mbps or faster, whereas in London just under 20% of the tests recorded a speed of 7Mbps or faster. The turning point at 7Mbps reflects the switch from people on 20Mbps/10Mbps cable or ADSL2+ products to the the majority of people who still connect using ADSL which has a maximum download speed of around 7Mbps (maximum connection speed is 8,128Kbps, but actual useful data that can be transferred is around 7,000Kbps). 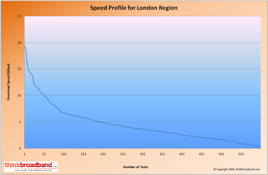 With Virgin Media and some ASDL2+ providers charging less for slower speeds one cannot assume that only 20% of people in London have access to high speed broadband, only that the 20% is a baseline. For example, where Virgin Media cable services are available only something like 25% opt for the highest speed service. With the ADSL2+ providers many people, even if opting for the capped speed (lower price) packages many people may see a speed improvement compared to standard ADSL. This data, while showing the digital divide does exist, shows that on average at this time the gulf is not insurmountable. With LLU coverage still increasing and BT Wholesale rolling out ADSL2+ products we may see this divide narrowing. The question is how wide are we going to allow the gulf to open up if fibre to the home or sub-loop unbundling is deployed in just parts of the UK, and does it matter? Other countries that are further down the road of true next-generation broadband services have clear gulfs in what speeds are available across their country. Perhaps the question needs to be asked whether broadband is just another service that we should consider when we move home, just like we do when balancing the time it takes to commute to work against the price we want to pay for our dream home. Or is broadband now a critical service that needs to be protected and enshrined within a Universal Service Obligation (USO)? More coverage is available in the BBC news article. Not really a surprise with the speeds there since urban areas have a higher density of properties around the exchanges compared to the rural ones as well. I just wish all LLU providers who use ADSL2+ would put customers on it instead of insisting ADSL is the right option for those who sync below 8Mb as Sky do. At least then we could get the most out of the old local loop we still use. The results are hardly surprising really - although the results are slightly better than I expected. I think that the time for a USO is now, but the likely hood is minimal at best. When you've got people like myself who live on a estate not 5 mins walk to a major town (Maidstone) who get 480Kbps (at 1dB SNR), BT will fight any move for a USO. I live just 17 miles from Manchester yet few people here get better than 500k. The speed issue is critical here, especially since many people work from home. I'm pleased that your report (and the BBC's one) finally mentions the rural broadband problem but, unfortunately, publishing information by region or even City / County does not give a true idea of the speeds rural users are getting. Given that you have data by postcode, would it not be possible to analyse those postcodes by, say, ACORN classification to give a useful picture of what the urban / rural disparity really is? this is why I have said before that BT should focus on the old cables and not ADSL2+, what is the use of having up to 24Mbit when a majority of people can't even get up to 8Mbit? Zyborg, very good point. ADSL2+ is money down the drain, with the majority of users not benefiting. Any techonolgy that is rolled out using copper is a stop gap til we get FTTH but then it'll be the rural users who will be last to get it, if ever. But then, people live in towns and cities for the extra facilities. Public transport, services, shops and maybe soon broadband! There is no chance Ofcom would impose a burden on BT which would prevent it making profits as a commercial company. As such, any USO obligations are likely to result in everyone paying more to subsidise the areas which cost more to provide connectivity to. There is perhaps a question of whether these days broadband is a necessity, and thus whether there should be more subsidies by central government. It's not just length of line that's a problem for speeds. I invariably sync at around 7Mbps, however I very rarely get anything over 3Mbps actual download speed with the various speed checkers, and more usually it is between 1-2Mbps at peak times of the day. This, according to BT, is simply down to 'contention' (or 'the internet') and there's nothing they can do. Line length for DSL technologies is normally the biggest factor, but local issues like exchange congestion, congestion at the ISP end and or a high error rate on the ADSL line can reduce actual speeds. Tweaking the computer so its optimal for your current broadband speeds can also be important. I fear that the BBC attempt to survey broadband speeds nationwide will likely prove to be very contentious. In my own case the BBC speedtest provided results varying from 1.9 to 3.9 Mbps, whereas downloading the 10MB Quicktime file, accomplished in 14 secs suggest a speed of around 7Mbps. 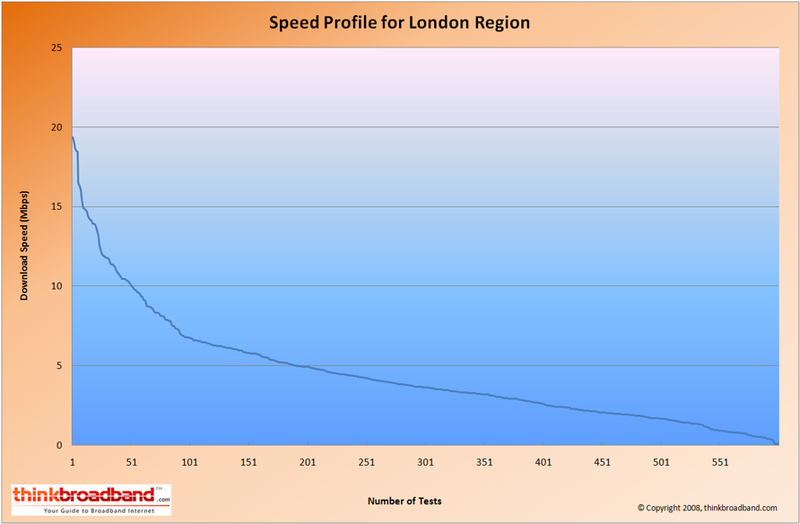 The Thinkbroadband test suggests a similar speed across many tests over many months. Incoherent data isn't likely to help matters improve but does allow for a lot of 'shouting' to take place! An interesting report Andrew. I agree with some of comments on here that BT's 'investment' in ADSL 2+ deployment is not worth while given the quality of existing infrastructure. As for price increases, if that's what it takes, I also think there's plenty of room for that but not with the products we have now - capped, shaped etc - people will not pay for that. "what is the use of having up to 24Mbit when a majority of people can't even get up to 8Mbit" - ADSL2+ has the potential to benefit any line with either more speed or more range as well as other enhancements. It's a natural progression like 802.11g followed 802.11b etc. I've never thought the fact that something doesn't benefit everyone as a reason not to do it - we should turn the mains gas off and stop subsidising railways on that basis. A USO need not be a threat to BT - levy 50p/month on *every* broadband connection for 2 or 3 years and use it to fund a broadband USO. Do I detect a sudden loss of interest ? dont be put off buy the S l o w display, just let it 'do its stuff' - much more reliable than some 'simple' ones! And you can choose different places in the world to re-check.. This is no surprise, it's all about the location of exchanges set up 100 years ago and the distance from them. Is speed everything? I live 3.5km from the exchange atcf. Since these crows don't fly over water the line line is likely to be longer. 62db attn and 6.8db NM. I read these forums, drool at others' speeds and feel hard done by. Then I think what would I do with 8Mbps that I can't do now? Not much! What do these rural businesses want the additional speed for. Real-time video? Hardly! Sorry! Forgot to say that my IP profile is 2mbps and the connection rock solid. Now the latter is important. The need for speed becomes more of an issue as people progress to multiple PC households. This is particularly an issue for a business, which uses the internet a lot and has multiple staff. ADSL2+ here. Sync at 12.5Mb, throughput 11.5Mb at any time of the day (apart from the BBC tester which gave results between 3Mb and 8.5Mb). But Think the next phase of investment ought to be in the backhaul to try address the contention issues. I think that a USO guaranteeing everyone 2Mb 95% of the time would be a good move - but people have to be prepared to subsidise it some way. Unfortenatly adsl2+ for someone like BT is something that is good value, cheap to deploy (dont get confused with 21CN) and the impact on its marketing is huge tripled headline speeds. As far as they concerned the fact only a small minority will get over 8mbit and a extreme minority will only get above 20mbit is irrelevant. Its all bean counters at BT. I can also verify at least 3 areas in my city are too far from a exchange. in comment to seb, I read everytime I visit this site about keeping rural broadband, which is already effectively subsidised by city dwellers on BTw services, so bearing that in mind I dont see a problem of a higher base price (very badly needed) to fund investment in a poor local loop infrastructure. It needs either more exchanges or some kind of FTTC to shorten copper lengths. to herdwick real life experiences show adsl2+ to mostly only benefit the shortest lines, whilst adsl2 without the + is better for longer lines. to andrew if speed is so critical why are BT not doing anything to improve it on 75% of lines? chrysalis - why should they? Where's the incentives when they can instead focus on things like switching to 21CN and offloading a lot of their admin onto ISP's, cutting their costs? Carpetburn - what's your distance from the exchange? We are all stuck with copper until fibre or wireless comes along. Its about 800 metres straight line distance and around 1500-2000 metres cable length. I am more than happy with my connection averages around the 16Mb mark, with about 7db noise margin and can easily be pushed to higher. I wouldnt go back to expensive BT based services even their ADSL2+ if they paid me. The only time id ever have BT for my internet is if that was the only option left for me, id even take the shocking Virgin cable first. Before i went to LLU i had an old 1Mb IPSTREAM based product, BT told me the most i could expect with ADSL MAX was 6Mb. Didnt take much of a decision to go to LLU with no stuuuupid profiling system and no stupid throttles or caps. It was a pretty accurate estimate of what speed i would get also with there guesstimate being 15Mb... Just a tad more accurate than BT and there rather to be blunt dumb 6Mb guess for a line of my quality. I am looking forward to a couple of years from now though and seeing what speed BT think my house with their ADSL2+ should get, that should be a laugh. "id even take the shocking Virgin cable first"
OK for CB with 1500m length, pity he does not want to contribute to the debate about the way forward. quote"OK for CB with 1500m length, pity he does not want to contribute to the debate about the way forward." You asked me in another news story what i would do to make services better and i answered, be a bit stupid to repeat that here. Especially as you didnt ask in this thread. @dawn_falcon yep lol i know they are bad but that would be a last resort thing, hopefully ill never have to touch them or BT for broadband ever again. CB - please tell us. My Experience is very similar to CB. I'm a bit further from the Exchange but still get 1.5MB/s down and 1MB/s up ADSL2+ is very sensative to the poor line quality and much more to poor internal phone wireing. MY speed is now consistantly in this region. I live in Oxford and consistently get download speeds of 5Kbps, plus a first class reliable service. The only minor problem is the technical knowledge of the support staff which is generally abominable - those gents in Calcutta again. Thankfully, you rarely need to phone them. Fibre to the cabinet (FTTC) is the solution for the UK. In the NW, I had my copper changed a while ago now i get speeds of around 8mbps! Here in Cumbria CA11 area, the best speed I can get is 1.9Mbps using ASDL Talk Talk Broadband. I have BT Yahoo broadband and I live in Watford, but I cannot get any greater speeds than (485 Kb/s download, 425 Kb/s upload).Shouldn't the price of broadband (current charge £15.99/month)be cut down according to what BT can deliver to their customers.If I was living in a rural area I would accept the above price. Following advice from people on a forum like this, I snipped the two spare wires on my old telephone extensions wiring. This gave me at least an extra 1000 Kbps. (I'm nominally with MAAF - now part of BT. BT has been no use to me what so ever, even leading me up the garden path with reference to a DACS (line sharing gizmo) and auxiliary equipment fitted to the line. I just wonder how many other numpties there are out there who could get a half decent speed with a few simple "tuning" improvements.